Source: Gifted by Estelle - thank you! I'm still a newbie when it comes to Sarah Ockler books. With this being my second book of her's to finish, I'm a bit surprised that it's taken me this long to truly discover her beautiful writing. I feel that Ockler deserves the same attention as someone like Sarah Dessen does in the YA contemporary market. More people need be reading her books and sharing her beautiful stories. They are very well-rounded, complete with family issues, self discovery, and a swoon-worthy romance. All of these elements embody the essence of what makes YA contemporary so enriching. Delilah is on her way to Red Falls, Vermont with her mother for the summer. But it's a trip that wasn't exactly planned, especially since the two of them haven't been back to this lakeside town in over eight years. The occasion that brings them back is a somber one, the death of Delilah's grandmother. Things aren't exactly peachy between Delilah and her mother, either. There's been a budding tension between the two of them and this trip back to her mother's childhood home, the same place Delilah spent every summer up until eight years ago, is only causing more bumps in this already rocky relationship. No one ever told Delilah why they stopped coming here, so many years ago, or why her grandmother and this town were erased from their lives so abruptly. The mystery behind all of this slowly unfolds as Delilah settles into the lake house that once housed so many summer-filled memories. She rekindles a friendship with the boy next door, Patrick, and a promising romance soon develops. 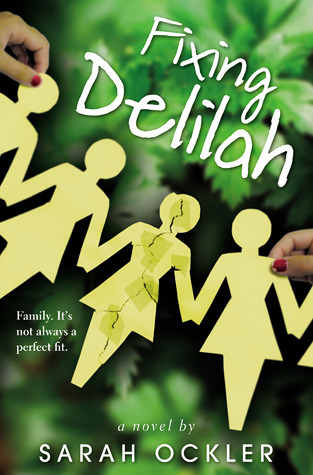 But as Delilah still remains on the sidelines, wondering what happened all those years ago, why her mother and Aunt are keeping secrets from her, it all becomes too much. The setting for this story is magical. I could picture everything from the maple leaf trees to the shimmering lake, from the bustling Main street lined with a candy store and coffee shop, to the old Victorian style homes. It posed as the ideal backdrop for a story so rich and deep as this one. The relationship between Delilah and her mother, and the family's past always remain in the forefront. While the new relationships Delilah manages with Patrick and Emily fill out the edges. I felt an honest, real connection that brought me even closer into this story. If you're like me and still somewhat new to Ockler's writing, I highly recommend starting with this one. She writes with such beauty and awe that it makes it difficult not to feel connected to this story. I particularly have a fondness for books set during the summertime, and don't mind a summer romance thrown in as well. But this book not only delivered on that, it also told a story about family and how secrets can damage the ones we love, even though we think we are protecting them. I adore Ockler's storytelling and will definitely be reading more by this fabulous YA contemporary author. I am so interested in this one! I love relationship centric books and the main character finding themselves and all that goodness. So I'm happy to hear Sarah nails it! This is the last Sarah Ockler book I have left to read (besides #scandal) but I'm kind of saving it, I guess. I'm glad you liked it, you definitely made me want to stop saving it! I loved this book to bits when I read it back when it just came out. Ockler wrote about the setting so beautifully and I loved how fluid the story seemed to flow, especially with everyone's interwoven problems and issues. I definitely agree that Ockler should be better known in the YA contemporary world since her writing and her stories are just so wonderful. I haven't heard of the author or the book but from your review it sounds like I need to! ooooh, I've never heard of this one. Just added it to my goodreads. I'm in dire need of good summertime reads. I'm trying to pretend it's no longer winter around here. We've been hammered with snow this year. lol. I absolutely loved Twenty Boy Summer! I've been meaning to read Bittersweet that has been sitting on my shelf, but I haven't gotten around to it yet! I will have to remedy that pretty soon, especially since you enjoyed this one so much. I hadn't heard much about Fixing Delilah until I read your review, but it sounds just as amazing as TBS. I love summer romances! AAAHHH! THIS BOOK! I saw a copy at work yesterday on sale for only 50 cents. I picked it up but decided against it. :) Definitely going to see if we still have it now! I have yet to read FIXING DELILAH, but it looks like I should remedy that based on your review! I think it sounds like a great contemporary novel. I love that it weaves together family, romance and summer -- and I'm seriously glad you liked it!